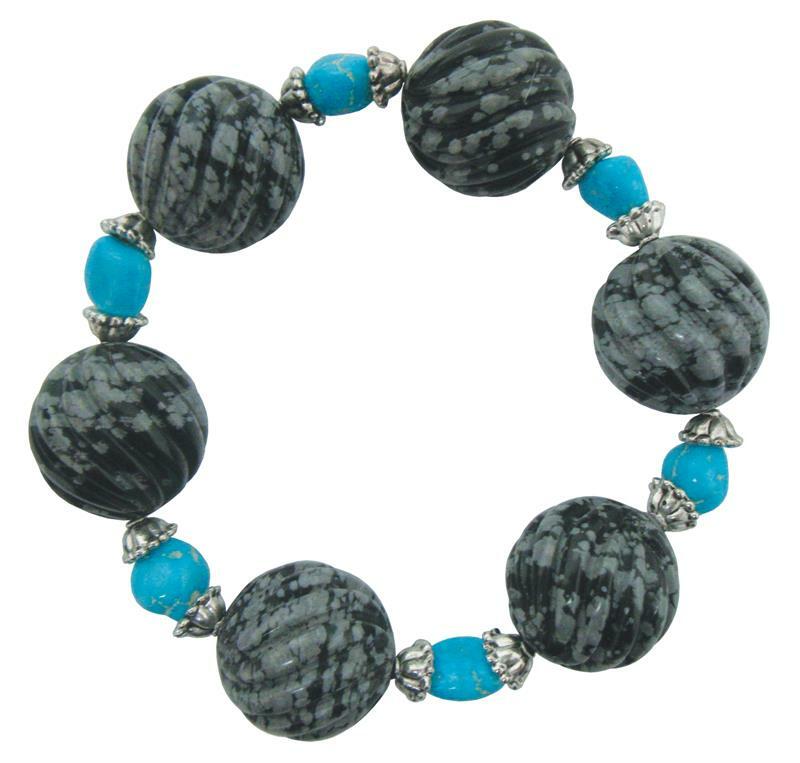 Item #DB-3030: 20mm round, fluted Snowflake Obsidian bead stretch bracelet with Arizona Turquoise beads and Pewter spacers. Item #CC-PBB10: 10mm round porcelain bead stretch bracelet (two colors available). Fits 7"-8" wrist. Item #CC-PBB512: Stretch bracelet with 12mm round Porcelain beads in assorted colors and patterns. Fits 7"-8" wrist. Item #CC-PBB15: 15mm round Porcelain bead stretch bracelet (assorted colors and patterns). Fits 7"-8" wrist. 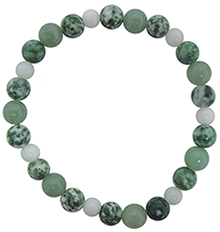 Item: #IGM-GAV-32: 30"-32" Continuous strand necklace of 8mm round Green Aventurine Beads. 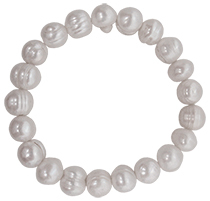 Item #FWP-BB-6: 8-10mm Baroque Fresh Water Cultured Pearl Stretch Bracelet; fits 7"-8" wrist. 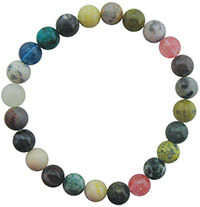 Item #MG-BSB-4: 8mm round mixed natural, dyed and man-made gemstone bead stretch bracelet. Fits 7"-8" wrist. BE-203: 16" long temporary strand of 8mm Round Green Aventurine Beads. Item #IGM-AM-SBB-15: Lot of ten Amethyst chip bead stretch bracelets. Fits 7"-8" wrist. 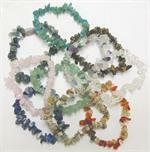 Item #IGM-AS-CHP-10: Lot of ten assorted gemstone chip bead stretch bracelets. Fits 7-8” wrist. 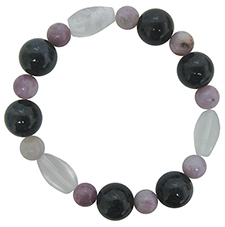 Item #IGM-ASB-8: Gemstone stretch bracelet with 12mm checkerboard cut assorted Amethyst, Rose Quartz, Rock Crystal Quartz, Green Aventurine, Moss Agate and dyed Yellow Calcite. Fits 7"-8" wrist. Item #IGM-ASB-12: Gemstone Stretch bracelet of 14mm square checkerboard cut assorted Amethyst, Rose Quartz, Rock Crystal Quartz, Green Aventurine, Moss Agate & dyed Yellow Calcite. Fits 7"-8" wrist. 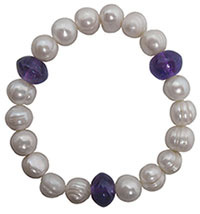 Item #FWP-AM-BSB-6 : Baroque Fresh Water Cultured Pearl and 11mm button shape or round Amethyst bead stretch bracelet. Fits 7"-8" wrist. Item #BO-FWP-5: Baroque Fresh Water Cultured Pearl and 8mm round Black Onyx Bead Stretch Bracelet. Fits 7"-8" wrist. Item #RQ-FWP-BSB-5 : Baroque Fresh Water Cultured Pearl and 8mm round Rose Quartz bead stretch bracelet. Fits 7"-8" wrist. 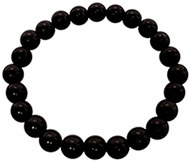 Item #BO-BSB-8: 8mm round Black Onyx bead stretch bracelet. Fits 7"-8" wrist. Item #BT-LEP-FL-6: 12mm round Blue Tiger's Eye, 8mm round Lepidolite & fancy Fluorite bead stretch bracelet. Fits 7"-8" wrist. 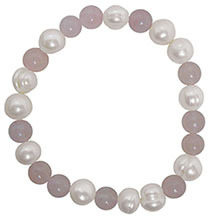 Item #PSB-89-PP: Average 8-9mm flat Button Pink/Peach Fresh Water Cultured Pearl Stretch Bracelet; fits 7"-8" wrist. 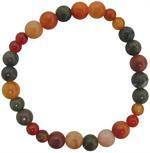 Item #CN-OVJ-BSB-4: 6mm and 8mm round Carnelian bead stretch bracelet with 8mm round Olive Jasper beads. Fits 7"-8" wrist. Item #CC-CB8E: Cloisonne round and oval bead stretch bracelet in assorted colors and designs. Fits 7"-8" wrist. Item #DN-FWP-B-6: Dyed & Natural Fresh Water Cultured Pearl stretch bracelet. Fits 7"-8" wrist. Colors and sizes of Pearls vary. 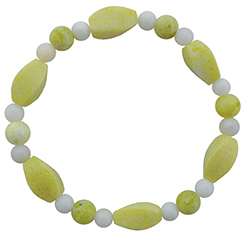 Item #FM-AV-SQ-4: 8mm round Feldspar with Mica & Green Aventurine bead stretch bracelet with 6mm round Snow Quartz beads. Fits 7"-8" wrist. Item #IGM-FWP-4-GL: Fresh Water Cultured Pearl and glass bead stretch bracelet in assorted colors; fits 7"-8" wrist. 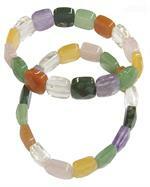 Item #IGM-GCB-6: Glass & crystal bead stretch bracelet in assorted colors. Fits 7"-8" wrist. 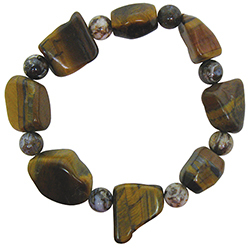 Item #TE-NDL-BSB-10: Golden Tiger's Eye nugget and 8mm round Silver Needle Agate bead stretch bracelet. Fits 7"-8" wrist. 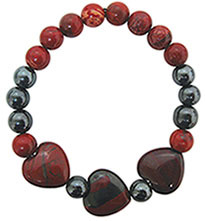 Item #BJ-HJ-BSB-5: 8mm round Hematite & Braciated Jasper bead stretch bracelet with 16mm heart shape Jasper/Hematite beads. Fits 7"-8" wrist. Item #HMT-BSB-4: 8mm round Hematite bead stretch bracelet. Fits 7"-8" wrist. 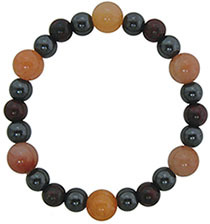 Item #HPJC-BSB-4: 8mm round Hematite & Poppy Jasper bead stretch bracelet with 10mm round Carnelian beads. Fits 7"-8" wrist. Item #IGM-LL-NB-2: Lapis Lazuli nugget stretch bracelet. Fits 7"-8" wrist. Item #GS-SE-12-20: Lot of ten 16" long temporary strands of assorted Green Serpentine Beads. 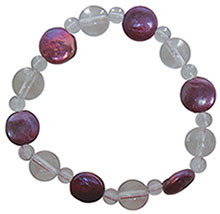 Item #RC-FWP-DP-4 : Treated purple coin shaped Fresh Water Cultured Pearl stretch bracelet with 6mm and 10mm Rock Crystal beads. Fits 7"-8" wrist. 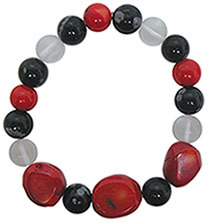 Item #DRC-SNW-RC-6: 13x15mm nugget Dyed Red Coral Bead stretch bracelet with 9-10mm round Dyed Red Coral, Snowflake Obsidian and Frosted Rock Crystal beads. Fits 7"-8" wrist. 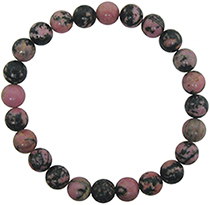 Item #RHD-BSB-5: 8mm round Rhodonite bead stretch bracelet. Fits 7"-8" wrist. 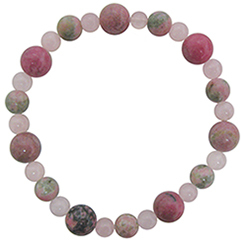 Item #RHD-TH-RQ-4: 10mm round Rhodonite, 8mm round Thulite & 6mm Rose Quartz bead stretch bracelet. Fits 7"-8" wrist. 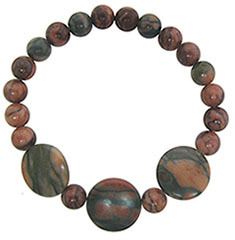 Item #RHY-BSB-4: 8mm round Rhyolite bead stretch bracelet with 18mm disc shape Rhyolite beads. Fits 7"-8" wrist. 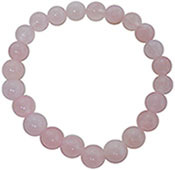 Item #RQ-BSB-6: 8mm round Rose Quartz bead stretch bracelet. Fits 7"-8" wrist. 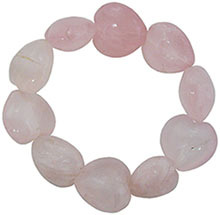 Item #RQ-HT-BSB-10: 20-22mm heart shape Rose Quartz bead stretch bracelet. Fits 7"-8" wrist. Item #SRP-SQ-BSB-4: 8mm round and twisted Serpentine bead stretch bracelet with 6mm round Snow Quartz beads. Fits 7"-8" wrist. 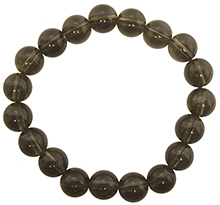 Item #SQ-BSB-6: 10mm round Smoky Quartz bead stretch bracelet. Fits 7"-8" wrist. 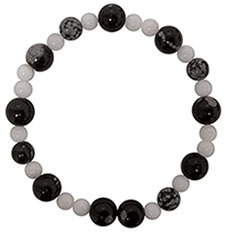 Item #SNW-BSB-4: 8mm and 10mm round Snowflake Obsidian bead stretch bracelet with 6mm round Snow Quartz beads. Fits 7"-8" wrist. 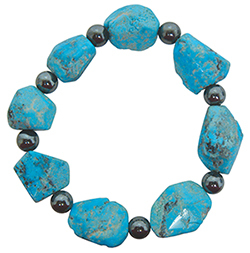 Item #TQ-HMT-BSB-15: Turquoise nugget stretch bracelet with 8mm round Hematite beads. Fits 7"-8" wrist.